The location had been selected by a scouting party sent north by Captain Juan Bautista de Anza, spearheading a Spanish drive to explore and settle New Spain’s northern frontier. 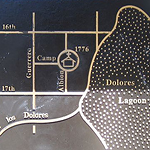 The creek and lagoon have long since vanished, drunk dry and buried under asphalt and concrete, but the name lingers on, applied to the Mission, to the palm-treed street out front, and to countless other Mission District locations: “Dolores”. It was just after noon on a sleepy Sunday, when suddenly, out of the clear October sky, it struck: The Great San Francisco Earthquake! Those of you who’ve heard to the Sparkletack episode in which Sam Clemens recounts his experience of the original Big One already know whereof I speak, but for the uninitiated — this “Great San Francisco Earthquake” happened in 1865. And even though that title would fade just three years later when a much bigger quake hit, and of course would disappear altogether when the 1906 monster laid waste to the city, the 1865 shaker was a pretty good one. City Hall was badly damaged. Fissures up to 3 inches wide opened in the ground, chimneys fell, walls cracked open, cornices plummeted to the pavement, and many brick structures were so badly damaged that they had to be knocked down — all of these effects amplified, of course, in the “new” areas of San Francisco, those recently created by filling the Bay. 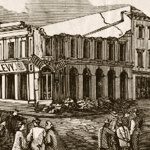 In fact it was this very quake which finally — after dozens of shocks since the founding of Yerba Buena in 1835 — led to San Francisco’s first attempts to make buildings earthquake-proof. 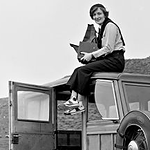 Dorothea Lange, the celebrated Depression-era documentary photographer, died in San Francisco today at the age of 70. After starting her career in New York, Lange set off with her camera to travel the country. She apparently got stranded in San Francisco, but decided to stay, and opened a portrait studio here in 1918. With the onslaught of the Great Depression, Lange turned her attention from the drawing room to the street — and her stark but compassionate portraits of poverty in our fair city soon led to New Deal federal employment. 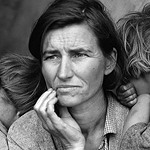 The “Farm Security Administration” sent Dorothea into the Dust Bowl to document the plight of America’s suffering farm families and migrant workers. The Feds made the resultant searing and intimate work available to newspapers free of charge, and the photos became icons of the Depression. These images profoundly influenced modern documentary photography, and make up the body of work for which she’s best remembered today. Lange traveled widely, but made the Bay Area her permanent home, a base from which she focused her documentary lens on challenging subjects ranging from the WW2 internment of Japanese-Americans, to the founding of the United Nations. I remember in school having to construct a mission out of coardboard, sand and shells for my forth grade history project. Oh how humiliating it was. Fast forward 25 years I began learning all about missions and their relationship to my immediate family. Namely my grandmother and great-grandmother. Having visited Mission San Antonio and Mission San Miguel many times near the town of Jolon, which is the name of her tribe (kind of like Ohlone) I can say that I am filled with an appreciation of its beauty and natural splendor, but at the same time filled with a little bit of heartache because of the transformation of native life caused by the mission system. I think you will find that is true for a lot of California Indians. 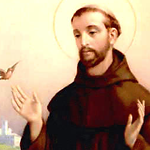 As for San Juan Batista de Anza, the trail he used cut right throught my grandmother’s back yard along the Salinas River in Atascadero (Salinan is the widely used name for my grandmothers tribe). The only way we can some to understand the full history of California’s missions and reckon with our complicated feelings about them is to read a historical account much like the one you constructed here in your podcast. Thanks, Allison! I often hesitate to even mention the Mission, precisely because of the “complicated feelings” that it engenders … it’s a mess, but then again, what part of history isn’t? In a nice corrective twist, though, the current curator of the Old Mission Museum — Andrew Galvan — is Ohlone, and his great-great-great grandparents are buried in the Mission Dolores graveyard. Another great episode! I especially liked that you had photography news about Dorothea Lange. Keep up the good work and stay sharp.